"Chocoholic? 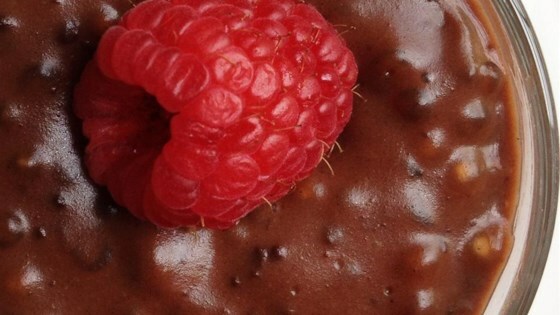 After eating this rich chocolate pudding you'll question the integrity of box puddings! Use dark, semisweet, or milk chocolate, whatever suits your taste buds! You may want to use a bigger saucepan, I think its easier to mix in. A whisk would beat a spoon by far (no pun intended). If this dish isn't rich enough for you, you could try using chocolate milk, but any milk is fine: skim, 1%, 2%, whole, even soy milk. Same thing with the chocolate; use whatever suits your taste buds: dark, semisweet, or milk chocolate." Milk the milk, tapioca, egg, and sugar together in a saucepan until the sugar has dissolved; allow to stand for 5 minutes. Whisk in the chocolate and cocoa powder. Place over medium heat, bring to a boil, whisking constantly, and let boil for 2 minutes. Remove from heat and whisk in the vanilla extract. Allow to cool for 20 minutes. Serve warm or chilled. It has been a long time since I seen chocolate tapioca pudding. My wife says there is no such thing. Now I can prove her wrong, and make it so she can taste it for herself. Thanks.